Tampa Snakes: There are about 25 species of snake in the Tampa Bay area, though only about ten of them are common. There are four types of poisonous snake in the area, as discussed below. Most snakes are actually harmless. We remove many snakes each month, from areas such as yards, inside lenais, pools, and even inside homes and attics. The most common snake that we deal with is the Florida Black Racer. It's a thin, fast, black snake with a white belly. We also commonly deal with Yellow Rat Snakes, Corn Snakes, Banded Water Snakes, Garter Snakes, and Ringneck Snakes. Most of these snakes are harmless. However, if you have a fear of snakes, or have one inside the home and want it out, we can help you. We offer emergency snake removal at any hour, and we also perform snake trapping and preventon services. If it sliters, we can get rid of it! Tampa's Venomous Snakes: There are four species of venomous snake in the bay area. They are not very common, but they are there, so please be careful around snakes, and exercise caution. COTTONMOUTH - also known as the Water Moccassin, it's an aquatic snake. It's thick and black as an adult, though the young have brown and tan bands. It's a member of the pit viper family, and it has a horrible and possibly fatal bite. This is probably the most common of Tampa's poisonous snakes. PYGMY RATTLESNAKE - this is a small snake, often not much more than a foot or a foot and a half. It's not deadly, but it's very agressive, and the venom will hurt terribly and cause heavy and permanent tissue damage. This snake can be hard to see or identify, and if you're bit, it may be worst pain of your life. EASTERN CORAL SNAKE - pictured above. Red touch yellow, kills a fellow. This snake has incredibly potent neurotoxic venom, but the snake is actually not very agressive, and it can't inject venom as quickly. Still, don't touch it! EASTERN DIAMONDBACK RATTLESNAKE - this is the deadly one. An adult can easily kill a person, no matter how fast that person is rushed to the hospital and treated with antivenin. If you see a large rattlesnake with diamonds on its back, stay away! All Tampa wildlife removal services are performed by All Pro Wildlife LLC, and based in Tampa FL, serving the entire Tampa Bay area, including Saint Petersburg Critter Pest Control and Clearwater Animal & Wildlife Removal. The owner of All Pro Wildlife trained extensively with the owners of AAAnimal Control, and he has our highest recommendation for wild animal removal work. Like us, All Pro Wildlife is not a pest control or extermination company, but a wildlife removal specialist, dealing only with animals, and not insects. 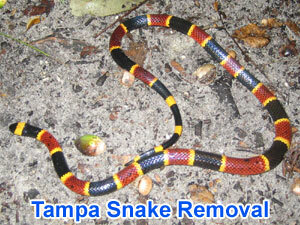 We have a great deal of experience working with snakes, and are expert Tampa snake trappers. We do not provide snake extermination, but practice humane removal, as well as control, exclusion, and prevention methods for Tampa snake problems. We of course do Clearwater snake control and St. Petersburg snake removal as well, and service the entire Tampa Bay area including Hillsborough County and Pinellas County. Please call 813.404.7033 any time to discuss your wild critter problem and to schedule an appointment.